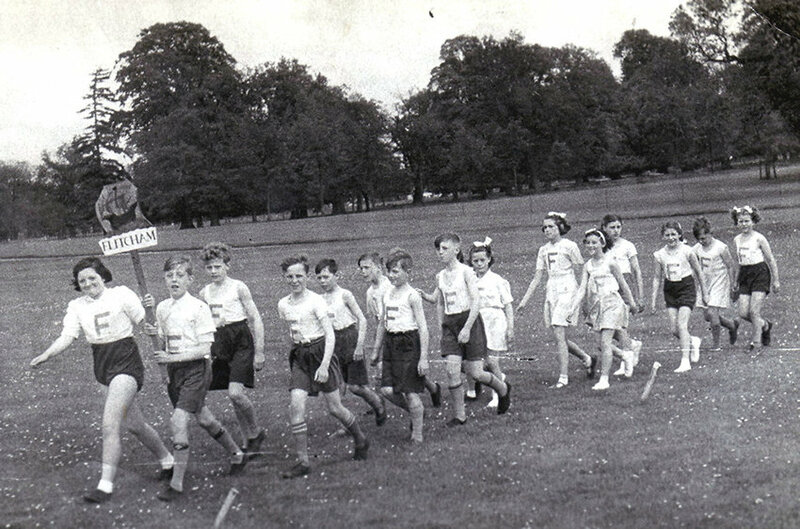 "F" for Flitcham: an annual sports event at Houghton Hall in the early 1950s. Joan Benefer leads the line and helps Peter Farrow to hold the Flitcham standard. The next boy might be Gerald Clark, followed by Colin Corley and Ray Matthews. The little girl leading the other girls is believed to be Rita Barlow, followed by Anne Barker. The next two are unidentified but the girl third from the right is June Whitmore. Note the boys' "long tops" socks.